Right now during this Earth time of year when the tomatoes are plentiful, the string beans tasty, the eggplants gorgeous, and the peaches amazing, I think about cooking. Not that I don’t the rest of the year, but for a vegetarian the plenty of the harvest is as close to nirvana as I can imagine. I belong to a CSA, Community Supported Agriculture where you buy directly from the farmers a share in what is being harvested. This week I received peppers, (red & green), zucchini, tomatoes, garlic, and eggplant. And I could only think of making a wonderful Ratatouille. I didn’t make a savory concoction, but made it with some seasonings that I really prefer. So here is my latest experiment. I hope you like it. If it’s a little loose, it’s because I didn’t write anything down while I was creating it. And as they say season to taste. Soak Garbanzo beans for 8 hours. Discard the water and then adding more water, cook at medium for 40 minutes. 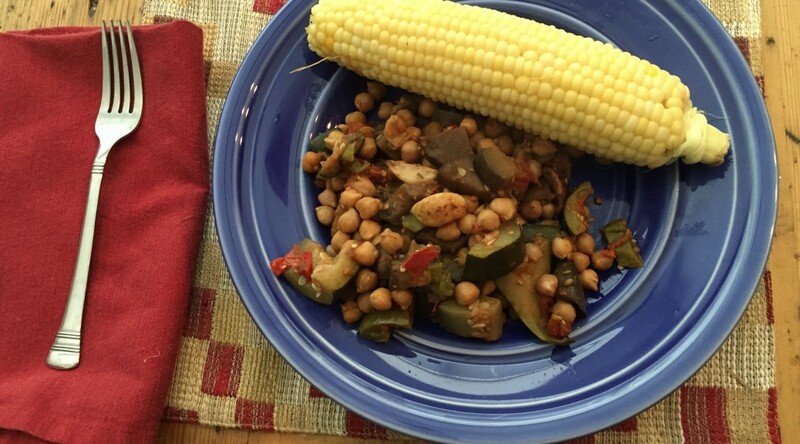 While the garbanzo beans are cooking chop the vegetables. Drain the water from the pot. Place the beans and vegetables, oil and spices and a ½ cup of water in a crock pot set for 3 hours at low. The great thing about doing it this way is while olive oil is used the vegetables are not fried. And there is the time for the vegetables and beans to cook and absorb the flavor of the cumin and coriander. In the picture you can see that I added an ear of corn, another gift from my CSA, but you could easily make a grain such as brown rice or quinoa, which would be fantastic. I love August in Washington. It isn’t only because DC quiets down. It is a far easier city to get around in during August. Congress is in recess. The President is off on vacation. Therefore, there are fewer motorcades. And many of the lobbyists leave, as there is less to do on a day-to-day basis. But another well kept secret about August is that there are fewer days over 90 degrees than July that are and it generally isn’t as humid as in July. Really! Google it. Fewer people and better weather would be reason enough to enjoy this time. But there is more. A client canceled his appointment at the last minute and I went for a walk on Tuesday. It was 82 degrees and I felt blessed to have the chance to take a midday break. Just a block away I was going north on 20th St., just above Massachusetts and I walked beneath a peach tree with over 50 unripe but amazing peaches hanging from all its branches. I was enraptured. It’s a block where no one stops to smell the roses, and I stopped right there. The canopy of peaches put me in another zone where I am in gratitude to nature. At that moment time was suspended and I could have been in an orchard in the country. Having taken a moment to pause, I noticed flowers blooming. Why wasn’t there a bench right here so that I could enjoy Mother Nature? I just smiled at this rather silly complaint. In Chinese Medicine we call this time period between the fullness of Summer Fire and the condensation of energy of the Fall Metal, the Earth element. The impact of this time is exactly as I experienced it. The energy is slower. It’s the time to rest in the hammock, gather all the harvest of berries, tomatoes, and watermelon and nature’s bounty, and avoid the insect bites. The frenetic energy of Fire is noticeably diminished. The days are shorter. The activity is quieter. You can imagine getting a fair amount of time to sip tea and look out the window, or better yet be outside. The Earth energy is about the harvest, but within ourselves it is about being grounded and nurtured by the earth and those in our families around us. Take the opportunity these days to walk and be in nature and feel the connection to the earth. Do what works for you to draw the earth energy into you. And as the earth takes care of us, we also need to take care of the earth. Are there things you could do differently? Do you compost? 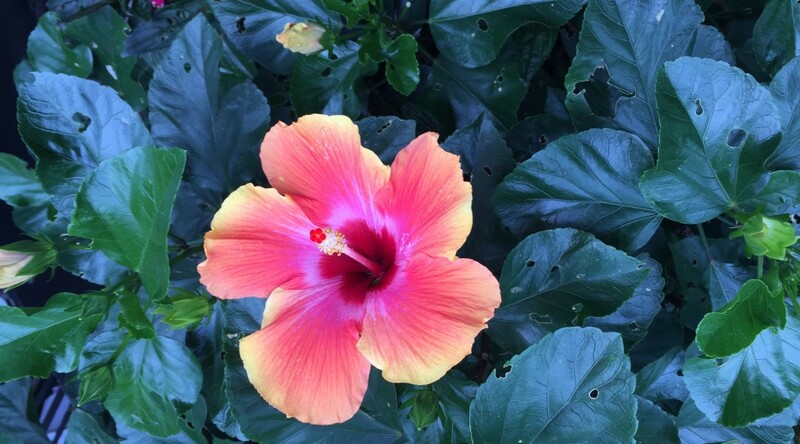 Do you have plants that you nurture? Do you eat more than you need? Do you take the opportunity to give to others who aren’t as fortunate? In our lives we get to ask whether we produced the harvest that we sought this year? Would anything have been better for our family, children, or friends that we could have done differently? Are we able to savor life? Like the peach tree, are we striving? Do we have a harvest that will ripen soon? Luckily we have another month to savor this time. Let’s see what tomorrow brings. Most people when they think about summer vacations the choice is between the mountains or the beach. For me it was a little different this year. I decided against a trip abroad or one to the beach. Instead, I decided to give myself something off the beaten track. 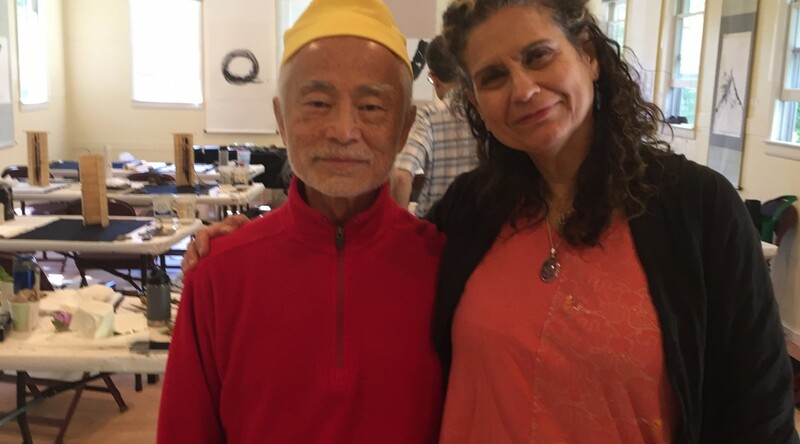 I went to Omega Institute to take a class on Zen and Creativity with Alok Hsu Kwang-han with Raylene Abbott. I met this couple last year at a showing of the documentary Moving From Emptiness: The Life and Art of a Zen Dude. During the film, I was struck by Alok’s authenticity, and open-heartedness and how he embraced life and creativity. There are certain books like Taoism and Creativity, which I have reread many times. This movie is like that, you can actually watch several times and see something that you hadn’t seen before. Whether it’s the dedication to heal suffering, or willingness to be playful, there is always something there. The way that he paints is a spiritual practice. So I took the plunge and for the first time in my life, went off to take a painting/creativity/zen class for a week. The class was not on how to draw an orchid, or tree. The class was on finding the spaciousness of creativity within. How often do we describe another person as being so creative as if they possessed something that we could never have? This class was the antidote for this kind of thought. The way Alok teaches is that one finds the space within of emptiness and presence, and not knowing to prepare to have the brush meet the paper. He would say statements like: “When the self is not present; creativity happens on its own.” The process was learning to get out of the way of the creativity. When there is no self, we discover many virtues of dignity and beauty. He broke it down into four things: being present, available, playful and in the unknown. Being with Raylene Abbott supported the creative inner forces. We would take walks and look at the land and the flowers and through her deep understanding and listening we would learn how to be in easier relationship with nature. There’s a flow in the natural world that we can’t imitate but can feel within. I would have been happy just doing the activity for 5 days. I was not creating expectations for myself to acquire a new skill as I often do in workshops. There were breakthroughs where I was able to find these empty and present moments, which allowed the creativity to happen. I had a wonderful vacation. Finding the way to access this creativity is a gift.